He had to be prophetic, but also monosyllabic. He had to speak, according to point 5, like "a fellow believer." 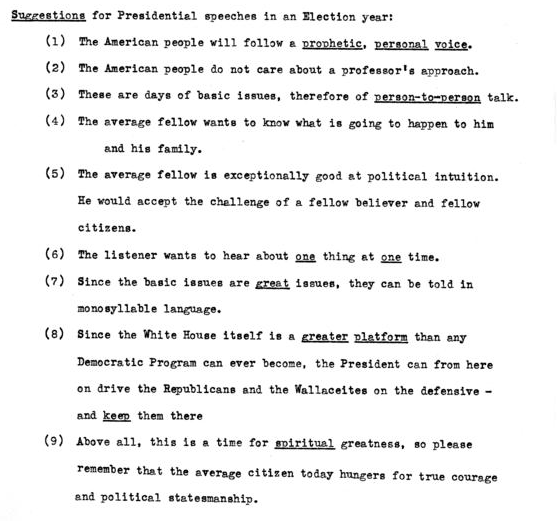 Truman did adopt this strategy, according to his campaign manager, William J. Bray. He learned to speak extemporaneously and more passionately, more persuasively. Truman started some speeches by saying he had a prepared text, but would put it aside to speak to this crowd "of everything that is in my heart and soul." As he spoke to crowds on his "whistle-stop tour" across the country, supporters starting shouting out, "Give 'em hell, Harry!" "Above all," point 9 says, "this is a time for spiritual greatness." But "great issues," point 7 cautions, "can be told in monosyllable language." Some of this advice, I suspect, is exactly what Republican candidates are hearing from their advisors today. Truman won the election with 2.1 million more votes than his Republican opponent. The Dixiecrat candidate Strom Thurman came in a distant third, carrying four states and one "faithless elector" in Tennessee. Wallace, who wouldn't disavow Communist endorsement or segregate his campaign, came in fourth with 2.4 percent of the vote.